Happy Wednesday! Can you believe that it’s the last Wednesday in 2017? Unbelievable! While 2017 wasn’t a great year of running for me, I love doing yearly recaps to see all that was accomplished this year. The Rock ‘n’ Roll Brooklyn 5 Mile race was just what I needed after a very disappointing experience at the Chicago Marathon the previous week. Not only did U enjoy the race, but I was able to cheer on my friends. My friend Shirley was running her first half marathon and it was nice to be able to support her. I was also able to cheer on Janelle and hang out with her after the race. My one and only 20 mile training run for the Chicago Marathon. I only had 18 on the schedule that day but my legs actually felt really good so I extended it to 20 miles. How often does that happen?! It was a great run and I was happy to have a smile on my face after 20 miles! I really love my Orange Mud HydraQuiver Single Barrel that I got in October. While I only technically used it once before the marathon (I know, rookie mistake), it ended up working great! I always carry my own water and fuel for half marathons, marathons and long training runs – but I don’t always want to wear a belt or hold something in my hand. This product really works for me because it’s not heavy or bulky and it’s easy to get my hydration while running. Also while technically it’s not gear, I tried a bunch of different fuel options this year and my favorite by far was Tailwind. No gut issues and it tastes great too! “It’s OK”. I heard these words over and over again after my bad race experience in Chicago. I was REALLY hard on myself and even considered giving up distance running. I just kept thinking, “Is it even worth it?” Not hitting my time goal in Chicago really crushed me, but I spoke to so many of you that knew exactly how I felt. It was nice to get advice from all of you because it was just so positive. The one theme throughout all the advice was “It’s OK”..
“It’s OK” that you didn’t hit your time goal, you’ll get it next time. “It’s OK”, we’ve all had a bad race. “It’s OK” if you want to take some time off, do what’s best for you. Again, thank you all for the advice and for giving me the courage to try again and run a marathon this spring! F*ck Yeah it’s Shalane Flanagan! This was a super easy choice this year. When I think of a badass runner, I automatically think of her. To be the first American woman to win the NYC Marathon in 40 years is just beyond amazing. I really want to get a shirt with “F*ck Yeah” written on it! I actually have 3 from this year. I’m always happy when I can find race photos where I’m actually smiling! Rock ‘n’ Roll Philly Half Marathon (September) – Looking like a hot, sweaty mess but near the finish line! The Rock ‘n’ Roll Philadelphia 5K is always a great race. The course is a pretty simple out and back but for some reason I always have fun on that course. I can’t really explain it since it’s not necessarily scenic or exciting, but I always smile from start to finish and I can’t wait to go back for my third straight year in 2018! Unexpected. This year of running did not go nearly as well as I thought it would. I didn’t get my marathon PR and a lot of my race experiences weren’t that great due to the horrible heat and humidity from this summer/early Fall. It was definitely disappointing, but I’m ready to bounce back and have more fun running and racing experiences in 2018! Infinite smiles and laughs along the way! That’s it! I hope you enjoyed my 2017 Year of Running recap. Here’s to more great miles, memories and races in 2018. 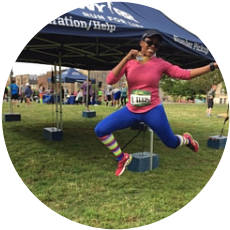 I’m linking up with Courtney from Eat Pray Run DC for her annual Year of Running linkup. I’m also linking up with Marcia from Marcia’s Healthy Slice, Erika from MCM Mama Runs and Patty from My No-Guilt Life for Tuesdays on the Run. And last but not least, I’m linking up with Rachel from Running on Happy, Lora from Crazy Running Girl and Debbie from Coach Debbie Runs for Coaches’ Corner! Love this look back! And someone “unexpected” seems like a positive spin on things. Hopefully 2018 will be great in unexpected ways! Sounds like a great year! I’ve never had a run over 15 miles where I wanted to keep running LOL. The would be awesome if you’re able to make it to RnR Philly this year – hope to see you! I think you had a great year, no matter what you think! Looking forward to 2018 and meeting up at RnR Chicago! I know you were disappointed with some of the outcomes of your races, but wow you really accomplished so much. It really is OK. Here’s to 2018! Thanks so much Deborah! Here’s to a great 2018! I know how disappointing Chicago was, but I think you still had a kick-buttocks year. I’m planning on R’n’R Chicago, and possibly Philly (?? )…I need to do some travel planning LOL I SOOOO hope we can meet up! Woo-hoo! That makes me smile! I really hope to see you in Chicago and Philly! I think you had a great year. Not all races go as planned…that is the life of a runner but you had so many that did. Hope you have an even better 2018. I’d love to squeeze in Chicago too. Fun recap of 2017. Hope that 2018 has a lot of great things in store! I agree! I was so impressed by her in the NYC Marathon. I totally agree Susan. “It’s OK’ will be my motto for 2018! All in all, I think you had a pretty great year of running! The one disappointment was Chicago, and, well, they all can’t be PRs. You trained great for that race and it just didn’t work out. ALL runners have a story like that. I know I do! Thanks so much Debbie. I’ll admit that Chicago still stings a little bit, but I’m not fixated on it which is a positive for me. I’m going into 2018 in a much better headspace! Looks like a pretty amazing year!!!!! I think Shalane is everyones most inspirational runner this year! Every time I cross a finish luck strong now I think and say Fu%& Yeah! I agree! She is so inspirational and down to earth – I love her! That’s amazing that you felt so great during your 18 miler that you extended it to 20 miles. How many people can say that?!? Exactly! I knew that I had to include that in my best run of the year because it’s so rare to feel good during the really long runs. Awwe Rachel you’re too sweet! It’s OK is great advice! There are a lot of worse things than a bad run or race, so it’s important to keep perspective. 🙂 It might not have been the year you were hoping for, but I really enjoyed following along. Cheers to 2018! Definitely true. I think I lost perspective along the way in my training this year so I’m not going to let that happen next year! It is okay. There are no guarantees and while it is so hard, it’s also just running. I remind myself of that often. But I also get it. It’s disappointing to lay out goals for the words and not quite meet them. I know you will have a great 2018, Kim! You’re so right Courtney! Going into 2018 I’m not going to put so much pressure on myself because as you said, it’s just running. Also it should be fun so I never want to lose sight of that! Love this recap! Even with some setbacks, you had an amazing year. I hope 2018 is even better for you! I think you had a great year even though you didnt hit your goal at your race. There were so many other awesome accomplishments along the way! I try not to put too much pressure on myself when it comes to races since there are so many other runs throughout the year. Looking forward to seeing what you accomplish in 2018! Thanks so much Lisa. I agree with you about not putting so much pressure on a race. Although I want a PR, I’m not going to obsess over it for my next marathon. Totally with you on Shalene, she’s so motivating to watch! Great recap of your year. Ah, races with goals. They are such a carrot on a stick to chase! You had a great year even without that. But you know it’s coming. Each race and each training cycle only gets you closer to it. Keep at it and we’ll get there. A carrot on a stick is a perfect way to describe it! And yes you’re right, we WILL get there! I know 2017 did not turn out quite the way you hoped, but you put in a ton of work that you can continue to build on. Cheering you on into 2018. Thanks Abby. I’m proud of all the training I did last year as well even if I didn’t get the end result that I wanted. Looking forward to seeing you in person again next year! Amazing year of running !! congratulations! Congratulations! One of my highlights this year was finally getting to meet you. 🙂 “It’s Okay” is a great lesson…the fall heat/humidity killed me too and my half marathons didn’t go as well as expected. I’m really looking forward to racing in 2018 – hopefully we’ll see each other again! Same here – meeting you in person was one of the highlights of my year and I really hope I get to see you at a race next year. Happy New Year Janelle! Thanks so much Jessie! I’m going to really keep “It’s okay” in the forefront of my mind when training this year. You’re so right that although “it’s just running” we get very invested in all the training that we do. Thanks so much for the kind words! I am very happy to have meet you in November and hope to see you again this year. I am glad we were able to connect this year! I love reading everybody’s year of running recap! I loved the part with the running advice, ” It’s okay” is so applicable to all areas of life, really. You can only focus on the positive and move forward. That was my favorite advice I received this year. Sometimes it’s easy to get too caught up in training and running, so it’s good to remember that “It’s okay”!